Miniature flashlight lamp, 6 V, 300 mA Miniature flashlight lamp, 6 V, 300 mA. Miniature bulb 3 V 120 mA Miniature lamp, voltage 3 V and current 120 mA. List Price 0.85лв. VAT Incl. 0.80лв. VAT Incl. 0.76лв. VAT Incl. 0.72лв. VAT Incl. Miniature flashlight lamp, E10, 1.1 V, 0.3 A Miniature flashlight lamp, E10, 1.1 V, 0.3 A.
Miniature flashlight lamp, 1.25 V, 0.25 A, E10 Miniature flashlight lamp, 1.25 V, 0.25 A, E10. List Price 0.80лв. VAT Incl. 0.76лв. VAT Incl. 0.72лв. VAT Incl. 0.68лв. VAT Incl. 0.64лв. VAT Incl. Miniature flashlight lamp, 2.8 V, 0.85 A, E10 Miniature flashlight lamp, 2.8 V, 0.85 A, E10. Miniature flashlight lamp, 2.8 V, 0.85 A, Рх13,5S, halogen Miniature flashlight lamp, 2.8 V, 0.85 A, Рх13,5S, halogen. 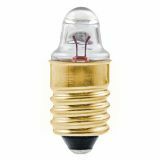 Miniature flashlight lamp, 4 V, 0.5 A, Рх13,5S Miniature flashlight lamp, 4 V, 0.5 A, Рх13,5S. 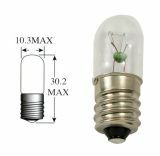 Incandescent Miniature Bulb Z1223, 2.4 V, 0.7 A, PX13.5S Miniature lamp for flashlight with a supply voltage of 2.4 V and current 0.7 A.
Miniature lamp, krypton, 3.6 V, 0.5 A, Рх13,5S Miniature lamp, krypton, 3.6 V, 0.5 A, Рх13,5S. Miniature krypton lamp, 3.6 V, 0.75 A, Px13,5S Miniature krypton lamp, 3.6 V, 0.75 A, Px13,5S. Miniature krypton lamp, 4.8 V, 0.75 A, Px13,5S Miniature krypton lamp, 4.8 V, 0.75 A, Px13,5S. Miniature krypton lamp, 7.2 V, 0.5 A, Px13,5S Miniature krypton lamp, 7.2 V, 0.5 A, Px13,5S. 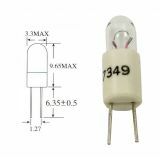 Miniature lamp, 12V (14.2V), 150mA, E10 Miniature lamp with rated voltage 12 V (14.2 V) and rated current 150 mA.